Donuts! There’s nothing like ’em! They’re nostalgic, indulgent, the epitome of hee, hee naughty comfort food. These lovelies, gluten-free sourdough and dipped in cocoa butter glaze, are hard to resist! Makes 12 donuts. Prepare donut pan by greasing it. Coconut oil spray also works well. Stir together sourdough starter, apple, melted fat, egg yolks, and sugar in a large bowl. Sift together sorghum, flax seed meal, gelatin, cinnamon, baking soda, xanthan, allspice, and sea salt in a medium bowl. Place egg whites in a metal mixing bowl and beat on medium-high speed until they become white, foamy, and somewhat voluminous. Stir dry ingredients partially into wet ingredients. When they are about halfway incorporated, add foamy egg whites, folding them in. Combine the three mixes until they are homogenized without over-mixing. Use a pastry bag or carefully spoon batter into prepared donut pan. Fill cavities almost full. Bake until puffed, browned, and a toothpick inserted into the center of one comes out clean, about 20 to 25 minutes. Start checking after 15 minutes. Cool for 20 minutes before popping donuts from the pan. Set aside until donuts cool. Chill donuts on cookie sheet before dipping to expedite the glazing process, either 10 minutes in the freezer or 30 minutes in the fridge. Use this time to prepare the glaze (see recipe below). Once donuts are chilled, dip each donut into glaze, swirling it a bit to evenly distribute the cinnamon and maple syrup. Flip over and glaze the second side, if desired, as well. Double dip the top side of each donut if you want a thicker glaze. Replace dipped donut on prepared cookie sheet and proceed with remaining donuts. 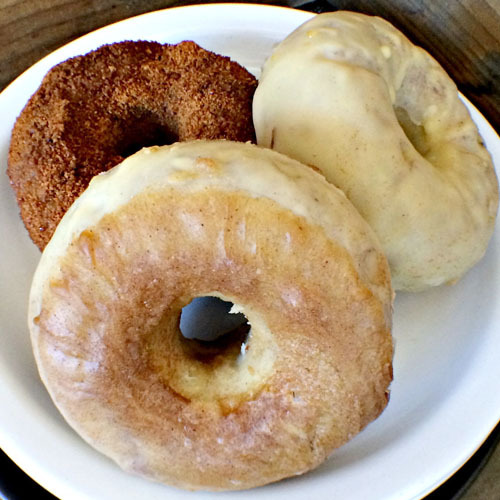 Chill donuts until serving or leave out at room temperature if your house is cool. For crumb donuts, dip wet glazed donuts into a mixture of coconut sugar and cinnamon: 1/4 cup sugar to 1 tablespoon cinnamon. Donuts may also be dipped in melted coconut oil before dipping in cinnamon sugar, which is easier and more cost effective. Chill them briefly to help set the oil and crumble.